NEW YORK, Oct. 2, 2018 /PRNewswire/ — A Neoclassical work of art. Playa Vista Isle is set upon 5± acres on one of the highest points of Florida’s “Millionaires Mile” and is one of the most expensive real estate listings in the entire country at $159 million. The unique estate will sell Without Reserve at a live auction on November 15th via Concierge Auctions in cooperation with ONE Sotheby’s International Realty. 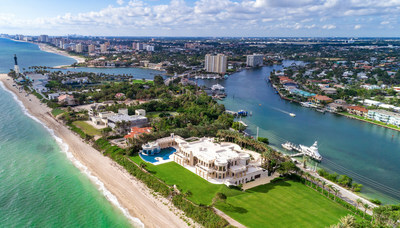 Completed in 2018 and ideally located in Hillsboro Beach, which is midway between the metropolitan areas of Miami and Palm Beach, Playa Vista Isle is the only Ocean-to-lntracoastal Waterway estate on the entire Gold Coast to offer both 500± feet of private oceanfront beach as well as two deep-water docks, able to accommodate both a 220± foot and a 150± foot yacht simultaneously on its 500± feet of Intracoastal frontage. An additional 17 space private dockside parking area provides the utmost convenience for guests. These unique features, among many others, firmly establish Playa Vista Isle as the most unique premier property in the entire country. Encompassing more than 58,000sf, the property was painstakingly constructed using the most exquisite hand-selected finishes from around the globe highlighted with 22-karat gold leaf gilding. Playa Vista Isle was awarded the “World’s Best Property”, “Best Residential Property-Florida”, and “Best Architecture Single Residence-Florida” by the International Property Awards. With 11 bedrooms and 22 bathrooms, Playa Vista Isle’s amenities include the world’s first private 3D-IMAX© in-home theater; a 20-car garage with secure tunnel access; 3,000± bottle wine cellar with individually-controlled temperature and humidity secured by biometric access with adjacent tasting room; 4,500sf heated infinity edge pool; oversize Jacuzzi perched 40± feet above the ocean featuring unobstructed panoramic views of the horizon; 13 water features including six waterfalls; and a putting green. There is an abundantly sized adjacent lot that can accommodate an additional structure, garden area, or recreational facility.